Plant tissues. Meristems. Root apical meristem. Atlas of plant and animal tissues. The image cames from an onion root. Put the cursor over the image to see where the image cames from. Organ: root apical meristem protected by the rootcap. Technique: paraffin section staining with acetic orceine. 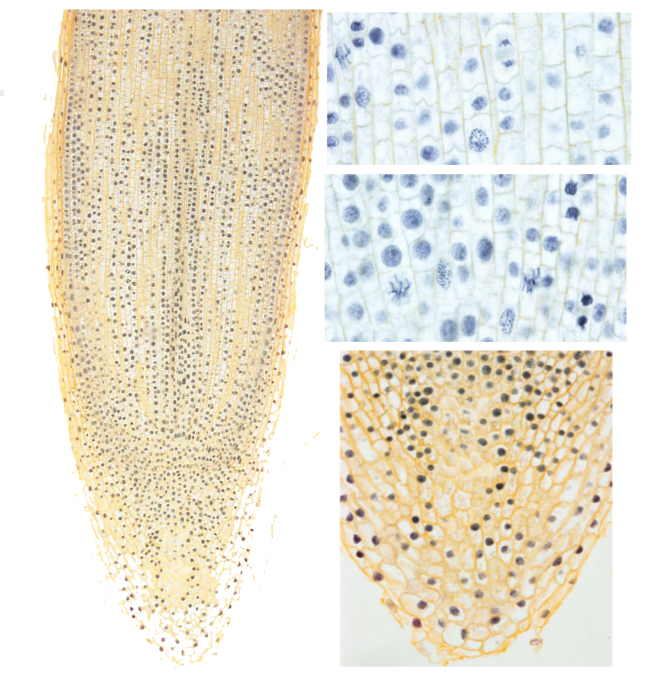 Origin of the main cell lineages from the root apical meristem of Arabidopsis (Modified from Furuta et al., 2014). 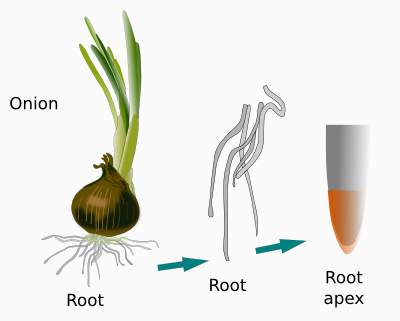 Root apical meristem is found in a subterminal position at the root tip. It makes the root to grow in length. They proliferate continously by mitosis. Meristematic cells have a large nucleus with condensed chromatin, a thin primary cell wall. Cell divisions are uniform but asynchronous, i.e. there are rather constant percentages of cells in each phase of mitotic division, but cells are in different mitotic phases. During cytokinesis, cell plate, also known as phragmoplast, is formed between the two daughter cells. The cell plate is mostly perpendicular to the longitudinal axis of the root, allowing the grow in length. This type of division is referred as anticlinal (see figure). The increase in root length occurs by the activity of this primary meristem, and during this process the primary tissues are formed. Caliptra or root cap surrounds the root apical meristem and protects it against potential ground abrasion during the root growth. Root cap is made up of parenchymatic cells that release substances containing glycosominoglycans, which work as lubricants. Some cells of the rootcap, known as statocysts, contain dense cytoplasmatic inclusions, mostly starch granules, that settle at the bottom part of the cell and are involved in the grow of the root toward the center of the Earth. 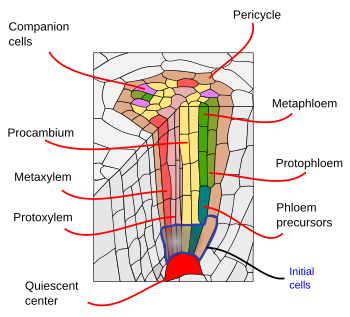 The outermost cells of the root cap die and are replaced by new ones coming from the meristem. Besides the cells that divide continuously, root apical meristem contains a group of inactive cells that form the so-called quiescent center. Not all authors describe this center, but others propose that constitutes a reservoir of cells to be used in the regeneration of damaged meristematic areas. Furuta KM, Hellmann E, Helariutta Y. 2014. Molecular control of cell specification and cell differentiation during procambial development. Annual review of plant biology. 65:607-638.